3 Wherefore have we fasted, say they, and thou seest not? Wherefore have we afflicted our soul, and thou takest no knowledge? Mark 7: 20 And he said, That which cometh out of the man, that defileth the man. 21 For from within, out of the heart of men, proceed evil thoughts, adulteries, fornications, murders, 22 Thefts, covetousness, wickedness, deceit, lasciviousness, an evil eye, blasphemy, pride, foolishness: 23 All these evil things come from within, and defile the man. Ps. 101: 4 A froward heart shall depart from me: I will not know a wicked person. And that thou hide not thyself from thine own flesh? Receiving God’s Blessings On My Life. Eph. 6:10 Finally, my brethren, be strong in the Lord, and in the power of his might. 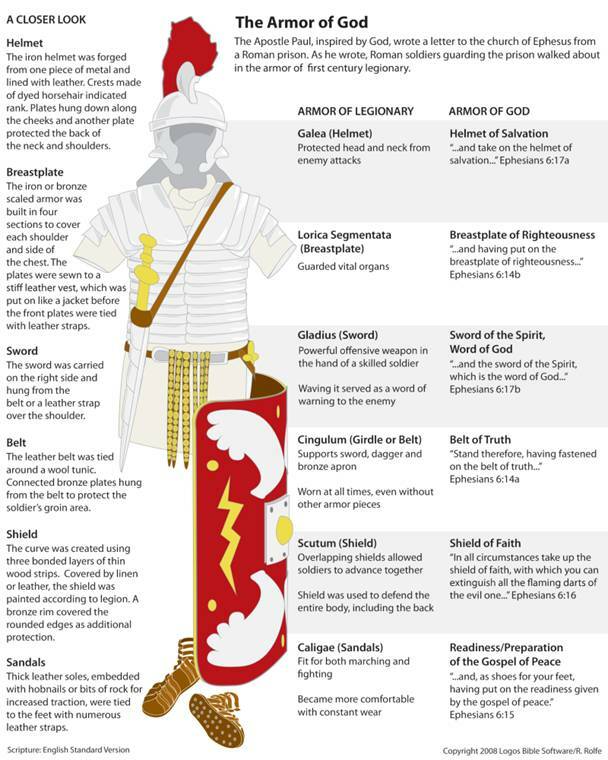 11 Put on the whole armour of God, that ye may be able to stand against the wiles of the devil. 12 For we wrestle not against flesh and blood, but against principalities, against powers, against the rulers of the darkness of this world, against spiritual wickedness in high places. 13 Wherefore take unto you the whole armour of God, that ye may be able to withstand in the evil day, and having done all, to stand. 14 Stand therefore, having your loins girt about with truth, and having on the breastplate of righteousness; 15 And your feet shod with the preparation of the gospel of peace; 16 Above all, taking the shield of faith, wherewith ye shall be able to quench all the fiery darts of the wicked. 17 And take the helmet of salvation, and the sword of the Spirit, which is the word of God: 18 Praying always with all prayer and supplication in the Spirit, and watching thereunto with all perseverance and supplication for all saints; 19 And for me, that utterance may be given unto me, that I may open my mouth boldly, to make known the mystery of the gospel, 20 For which I am an ambassador in bonds: that therein I may speak boldly, as I ought to speak. Jn 18: 37 Pilate therefore said unto him, Art thou a king then? Jesus answered, Thou sayest that I am a king. To this end was I born, and for this cause came I into the world, that I should bear witness unto the truth. Every one that is of the truth heareth my voice. 38 Pilate saith unto him, What is truth? And when he had said this, he went out again unto the Jews, and saith unto them, I find in him no fault at all. Jn 14: 6 Jesus saith unto him, I am the way, the truth, and the life: no man cometh unto the Father, but by me. 11 Cor 4: Therefore seeing we have this ministry, as we have received mercy, we faint not; 2 But have renounced the hidden things of dishonesty, not walking in craftiness, nor handling the word of God deceitfully; but by manifestation of the truth commending ourselves to every man’s conscience in the sight of God. I Tim 6: 11 But thou, O man of God, flee these things; and follow after righteousness, godliness, faith, love, patience, meekness. 12 Fight the good fight of faith, lay hold on eternal life, whereunto thou art also called, and hast professed a good profession before many witnesses. ii Tim 2: 22 Flee also youthful lusts: but follow righteousness, faith, charity, peace, with them that call on the Lord out of a pure heart. Col. 4:4 Masters, give unto your servants that which is just and equal; knowing that ye also have a Master in heaven. I Jhn 3: 7 Little children, let no man deceive you: he that doeth righteousness is righteous, even as he is righteous. Rom 12: 8 If it be possible, as much as lieth in you, live peaceably with all men. 19 Dearly beloved, avenge not yourselves, but rather give place unto wrath: for it is written, Vengeance ismine; I will repay, saith the Lord. 20 Therefore if thine enemy hunger, feed him; if he thirst, give him drink: for in so doing thou shalt heap coals of fire on his head. 21 Be not overcome of evil, but overcome evil with good. Mark 9: 50 Salt is good: but if the salt have lost his saltness, wherewith will ye season it? Have salt in yourselves, and have peace one with another. I tim 1: 15 This is a faithful saying, and worthy of all acceptation, that Christ Jesus came into the world to save sinners; of whom I am chief. 16 Howbeit for this cause I obtained mercy, that in me first Jesus Christ might shew forth all longsuffering, for a pattern to them which should hereafter believe on him to life everlasting. Titus 3: 5 Not by works of righteousness which we have done, but according to his mercy he saved us, by the washing of regeneration, and renewing of the Holy Ghost; 6 Which he shed on us abundantly through Jesus Christ our Saviour; 7 That being justified by his grace, we should be made heirs according to the hope of eternal life. Ps. 42: 11 Why art thou cast down, O my soul? and why art thou disquieted within me? Mk. 11:22 And Jesus answering saith unto them, Have faith in God. 23 For verily I say unto you, That whosoever shall say unto this mountain, Be thou removed, and be thou cast into the sea; and shall not doubt in his heart, but shall believe that those things which he saith shall come to pass; he shall have whatsoever he saith. 24 Therefore I say unto you, What things soever ye desire, when ye pray, believe that ye receive them, and ye shall have them. I pet. 1: 24 For all flesh is as grass, and all the glory of man as the flower of grass. The grass withereth, and the flower thereof falleth away: 25 But the word of the Lord endureth for ever. And this is the word which by the gospel is preached unto you. Jer. 23: 29 Is not my word like as a fire? saith the LORD; and like a hammer that breaketh the rock in pieces? 30 Therefore, behold, I am against the prophets, saith the LORD, that steal my words every one from his neighbour. 31 Behold, I am against the prophets, saith the LORD, that use their tongues, and say, He saith. 32 Behold, I am against them that prophesy false dreams, saith the LORD, and do tell them, and cause my people to err by their lies, and by their lightness; yet I sent them not, nor commanded them: therefore they shall not profit this people at all, saith the LORD. I peter 3: 12 For the eyes of the Lord are over the righteous, and his ears are open unto their prayers: but the face of the Lord is against them that do evil. 13 And who is he that will harm you, if ye be followers of that which is good? Jn 16: Verily, verily, I say unto you, Whatsoever ye shall ask the Father in my name, he will give it you. 24 Hitherto have ye asked nothing in my name: ask, and ye shall receive, that your joy may be full. Jn. 14: 4 If ye shall ask any thing in my name, I will do it. Matt. 7: 7 Ask, and it shall be given you; seek, and ye shall find; knock, and it shall be opened unto you: 8 For every one that asketh receiveth; and he that seeketh findeth; and to him that knocketh it shall be opened. 9 Or what man is there of you, whom if his son ask bread, will he give him a stone? 10 Or if he ask a fish, will he give him a serpent? 11 If ye then, being evil, know how to give good gifts unto your children, how much more shall your Father which is in heaven give good things to them that ask him? 12 Above all, my brothers, do not swear — not by heaven or by earth or by anything else. Let your "Yes" be yes, and your "No," no, or you will be condemned.